Motoshi Fujita had a short career (1957 to 1964) as a pitcher, and much later (1981 to 1983 and again 1989 to 1992) a manager. All of it was spent with the Giants and all of it was exceptionally successful. As a pitcher he went 119-88 with a 2.20 ERA. The teams that he managed went 516-361. After attending Keio University Fujita went undrafted (despite considerable success in college), and so he went to play in the industrial leagues. After four years he was selected by the Giants. He broke into the big time at 25, winning the rookie of the year award, and the MVP in both 1958 and 1959. During his playing days the Giants made the Japan Series five times (with two wins). After his retirement he was hired as a pitching coach, and served in that capacity while the Giants had their string of nine consecutive Japan Series victories. The Giants went 2-2 in the Japan Series when he helmed the team. Fujita was a good pitcher, even a great one, but his career was short (due to injury) and his time at the top of his game even shorter. For hall-of-fame purposes, it’s really only 1957-9 that make any difference. It’s clear that he wouldn’t be a hall of famer but for his managing career. On the other hand, his managing career was also very short (although quite successful). I don’t know how Japan treats its managers well enough to know if it would have qualified him for the hall, but I’m inclined to think not. He really seems to me like a hybrid candidate, who had to be (and was) excellent in both of his roles to make it. It's hard to find an American player who is a good match for Fujita. Johan Santana is probably closest, although he’s not really a good match, because Fujita’s managerial career is so important to his hall of fame case. The card is from 1959. It’s a part of the JCM 31e set. Last edited by nat; 08-22-2018 at 08:09 AM. Reason: Correcting picture. Masaichi Kaneda is Japan’s greatest pitcher. He played for Koketetsu (the Swallows) from 1950 to 1964, and the Giants from 1965 to 1969. His career W/L record is 400-298 over an astounding 5526 innings. Kaneda combined a role in the rotation (569 games started) with regular work in the bullpen (another 375 games). The work in the bullpen wasn’t just when he was old and slipping. In 1956, when he was at the very peak of his career, he appeared in more games out of the bullpen than he did as a starter. The 5500 innings that Kaneda pitched is a mind-blowing number for any pitcher, much less one from Japan where the seasons are shorter. Nolan Ryan clocked in with about 200 fewer innings, Phil Niekro, throwing knuckleballs, pitched about 100 fewer. In fact, his IP total would rank fourth all-time in MLB, behind Cy Young, Pud Galvin, and Walter Johnson. Jim Derrington – one game, six innings pitched, five earned runs allowed, for the 1959 White Sox. Alex George – five games, ten at bats, one hit, for the 1955 A’s. Roger McKee – four games, thirteen innings, 9 ER, for the 1943 Phillies. Carl Sheib – six games, eighteen innings, 9 ER, for the 1943 A’s. Coonie Blank – one game, two AB, no hits, for the 1909 Cardinals. Joe Stanley – one at bat (ended in a K) for the 1897 Senators. Tom Hess – two at bats, no hits, for the 1892 Orioles. Willie McGill – 183 IP for the 1890 Cleveland Infants of the Player’s League. Piggy Ward – five at bats (no hits) for the 1883 Philadelphia Quakers. Leonidas Lee – four games, 18 AB, five hits, for the 1877 Brown Stockings. Frank Pearce – one game, four IP, for the 1876 Louisville Grays. Jim Britt – 336 IP for the 1872 Brooklyn Atlantics (led league in losses). Kaneda’s win total came despite playing for the Swallows, a perennial cellar-dweller. (Going to the Giants must have been a welcome change.) He was noted for an extremely fast, although often erratic fastball, but his money pitch was a curve. Famously both Nagashima and Oh went 0-4 with 4 strikeouts in their first games against him. Eventually the incredible number of innings that he pitched caught up to him, and he developed an underhand delivery to help relieve the pain from pitching. Amongst his accomplishments Kaneda won three Sawamura awards. In 1963 Sports Illustrated ran a story on him, calling him “an oriental Warren Spahn”, which makes sense given that Spahn was a great left-handed pitcher with a long career who was just wrapping things up in 1963. But I think that Kaneda was the greater pitcher. They note that he holds almost every Japanese pitching record, what they didn’t know was that he had six more seasons remaining in that left arm. As far as I know the only significant counting stat record that he doesn’t hold is shutouts – he trails Victor Starfin by one. (His record for appearances has since been eclipsed by relief pitchers.) It’s always dangerous to say things like this, but I’m fairly confident that most of his career records are untouchable. After retiring from pitching he managed the Orions, winning the Japan Series with them. He also founded the Meikyukai, for reasons that I’ve never been quite clear on. It’s a club for great Japanese players born during the Showa period (1926-88), one gets in for having 2000 hits, 200 wins, or 250 saves. All stats earned after making a player’s Japanese debut count, so Hideki Matsui is a member, even though he only had about 1300 hits in Japan. (Curiously, stats earned prior to appearing in a Japanese game do not count.) They play charity golf tournaments and things like that. Kaneda says that he considered coming over to play in the States, but doesn’t regret staying in Japan. Residual hostility from the war, together with the fact that he didn’t speak English, he says, would have made the transition difficult. Here’s a short clip of Kaneda pitching. No date given, but he’s still on the Swallows, so it’s prior to 1965. My card is from the JGA 149 set, issued in 1962. That card is not Motoshi Fujita but Yoshio Yoshida of the Hanshin Tigers, and is the card that you already used for Yoshida's biography. Can you show which Fujita you have? I would love to see it. Oops! Confused the black and white cards for each other. It should be fixed now. Yamamoto was a great slugger for the Hiroshima Carp. Harimoto is Japan's all-time hit king (and atomic bomb survivor). Hara was a great third baseman and manager. Fukumoto was Japan's greatest leadoff hitter. Higashio was the ace pitcher for a very successful Lions team. And Kagawa, well, Kagawa played professional baseball. All of them except Kagawa are hall of famers. Images of the cards are below (except for the second Higashio and the second Hara cards, which are in my write-ups of them), in the order in which they are listed above. My first priority are the Japanese hall of famers that I'm still missing (list to be found below), but I'm willing to trade for some American cards as well. I could use a 1963 Topps Ron Santo, a 1954 Topps Whitey Ford, a 1950 or 51 Bowman Larry Doby, and, well, lots of pre-war cards. Helpfully, I'm not too particular about condition, "well loved" cards are welcome. Last edited by nat; 09-04-2018 at 09:23 AM. Hisanori Karita played for, well, lots of teams, from 1936 to 1951. He was a second baseman who starred during the deadball era of the 30s and 40s. And, man, was the ball dead. In 1939 he slugged .283, which was only five points below average. The year before he posted a slugging percentage of .411. I don’t know any easy way to find league leaders in Japan,* but that mark has to be up there. Japanese pro leagues didn’t form until he was 26, so that’s when he got his start. Like many players he missed several years during the war (and sat out 1949), but he played until he was 41. Karita’s raw totals (for example, 619 hits in his career) look extremely unimpressive – especially for a hall of famer – but this is due to three extenuating circumstances. The first, as mentioned, is that he didn’t get a chance to play pro ball in his early 20s. Most hall of famers break in very young; the guys who are 26 year old rookies tend to be barely-competent bench players and relief pitchers. Karita has an excuse, of course, but losing four or five years off the begging of your career is going to cost you. The second of the extenuating circumstances (also noted) is that Japanese baseball had basically no offense at all when he was playing. Japanese deadball was more extreme than American deadball, and American deadball was plenty extreme. Finally, while Japanese seasons are still shorter than American seasons, in the early days they were much shorter. Interestingly, they were variable even within a league: not every team played the same number of games. The fall 1936 season featured teams playing between 26 and 30 games. He played in the spring seasons as well, but when you’re playing max 60 games a year, it’s going to be hard to collect very many hits. *I mean, I could go through and check everyone manually, but I’m much too lazy to do that. It would be nice if the raw data were available in a single file and you (meaning I) could get Excel to do it. In addition to being a good hitter, he was known for his fielding. Fitts and Engels think that he was one of the best ever. His ability to turn double plays was especially noted. Unfortunately I have been able to find no fielding data at all, so I have no way to evaluate these claims. He also tried his hand at pitching (throwing a total of 41 innings over three seasons), but he was beyond terrible. In 1939 he pitched 31 innings to a 4.34 ERA, against a league average of 2.50. That would be like having a 7.38 ERA in today’s American League. For most of his pro career he also managed the teams that he played for, but the results were unimpressive, his teams were mostly second-division, and a few of them were quite bad. Karita was active in baseball before the formation of the professional leagues. He attended, and presumably played for, Hosei University. He played against the Americans on the 1934 tour. On the All-Japan team he played shortstop and typically hit second. During the November 11 game, in an effort to make the games more competitive (the Americans won all of the previous games by very lopsided scores), the visitors and the Japanese all stars played mixed teams, with six Americans and three Japanese on each team. Karita played with Americans Ruth, Warstler, Foxx, Averill, and Berg (I don't know who their sixth American was). They won 13-2. Karita hit .276 for the series, which is considerably better than his career mark of .219. Less-known than the American tour of Japan is the Japanese tour of North America. A Japanese all-star team went on a four month tour through North America in 1935. The pitching staff was led by teenagers Sawamura and Starfin. The rest of the team might not have been quite as heralded (although Starfin wasn’t yet the big star that he would become), but it did feature Karita in the middle infield. His most impressive feat was stealing three bases in a game against the Vancouver Athletics, and he hit a rare home run in Winnipeg. Here is a picture from his time in Vancouver. His double play partner on the tour was Takeo Tabe. Like Karita, Tabe is in the hall of fame, but Tabe never did go pro, and he was killed in combat in 1945. Karita also served in the war. I was able to locate little in the way of records concerning his service. He was stationed in China, but that’s about all that I could find. I don’t know if he was wounded (if so it would explain his absence from baseball even after the end of the war), but in any case he was in good enough shape to return to pro ball in 1947. Albright thinks that in order for Karita to be deserving of his place in the hall of fame, he’s got to get a lot of credit for his play before the formation of the professional league. If the hall of fame is about recognizing the greatest players, that has to be right. But I suspect that the reason he’s in the hall of fame doesn’t boil down to voters evaluating his play prior to 1936 and deciding that it, plus his pro career, totals enough value to match the hall’s established standard. Karita was a star during a transitionary period in the history of Japanese baseball, when it first staked a claim on the world stage, and when it made its first foray into professionalism. I suspect that this, as much as his actual contributions on the field, is responsible for Karita’s place in the hall of fame. In some ways I like to compare him to John Ward. Now, Ward was the better player – he’s arguably qualified for the hall of fame on the merits. But even if he had come up short, the hall of fame needed, in some way, to recognize Ward because of his role in the formative years of American baseball. Karita wasn’t the mover and shaker that Ward was – he wasn’t instrumental in founding a new major league, for example – but the Japanese hall of fame would be incomplete if it didn’t recognize the contributions of the people who made Japanese baseball what it is today. Hisanori Karita is not the only one who is responsible for that, or even the one who is most responsible, but I suspect that that, more than what he accomplished as a player or as a manager, is why he is in the hall of fame. The card is from the JRM 24 set, issued in 1947. Having ‘Tokyo’ on the card doesn’t do much to narrow down the team he’s playing for, but 1947 was his first and only year playing with the Flyers. It is blank on the back. Hiromitsu Kadota was a big immobile slugger, mostly playing for the Nankai Hawks, from 1970 to 1992. He was still slugging in excess of .600 after he turned 40. Clearly a middle-of-the-order type (he cleared 100 RBIs several times, but never made it to 100 runs), Kadota tallied 567 home runs, to go with 2566 hits and a career 289/379/529 slash line. Until 1977 he was an outfielder, but he spent basically the last 15 years of his career as a designated hitter. What Kadota is most famous for is his performance as an old player. He is the oldest MVP in Japanese history – taking the title in 1988 at the age of 40. In addition he is the oldest player to lead the league in RBIs, toping the league with 93 as a 41 year old. As a great player who didn’t really age, Kadota predictable ranks high on Japan’s all-time leader boards. He’s third in career home runs, and top ten in most other offensive categories. In total he was selected to seven best-nines, and was a 14x all-star. Albright regards him as the 16th greatest player in Japanese history. Here’s some footage of Kadota hitting home runs. My card is from the 1984 Calbee set. Tadashi Sugiura spent thirteen years pitching for the Nankai Hawks. It was only the first half of that time, however, that he was really productive. He was an ace-quality pitcher from 1958 to 1964, at which point he became a relief pitcher. If not for the switch to relieving he would have qualified for the golden player’s club pretty easily, despite retiring at 34. As it is, he won 187 games while losing 106, with a career ERA of 2.39. That ERA is a good number, but it’s aided by his years in the bullpen. He had a number below that mark for his first three seasons, and then never again until he switched roles. The beginning to his career really was quite impressive. He took home the rookie of the year award in 1958, no doubt thanks to 27 wins in 299 innings pitched, with an ERA of 2.05. (Now don’t get too excited about that ERA, the league as a whole had a 2.83 mark. So it’s good, but this was a pretty low scoring league.) The following year he won 38 games over 371 innings pitched, and took home both the Pacific League MVP Award, as well as the Japan Series MVP award (he pitched every game of the series). It was certainly his best year. He recorded an ERA of 1.41, and was only 23 years old. But as a 23 year old he already had more than six hundred professional innings on his arm (after who knows how much pitching in high school and college). At the age of 24 he pitched 334 innings, and his workload dropped off thereafter, culminating in relegation to the bullpen in 1965. It’s hard not to imagine that all the abuse his arm suffered when he was young had something to do with it, despite the fact that he was a submarine pitcher. Just how much heavy workloads contribute to arm injuries is controversial, but it’s hard to deny that they do. Throwing a ball overhand at extremely high speeds is just not something that we evolved to do. And, perhaps more to the point, every time you do it is a time that something can snap. Perhaps a heavy workload increases injury risk not because the tendons or ligaments or whatever wear down, perhaps it increase injury risk just because each time you throw a ball you’re rolling the dice, and if you roll the dice enough times eventually you’re going to lose. Albright ranks him as the 65th greatest Japanese baseball player, and 17th greatest pitcher. Admittedly I haven’t tried to put together anything like Albright’s ranking system, but this sounds aggressive to me. In part this could be a matter of taste. I’m happy saying that Sugiura’s 1959 was one of the greatest pitching seasons of all time, and since he was extremely good in 1958 and 1960-1 as well, he’s got a very respectable peak. Now, peak performance is clearly important, if for no other reason than in order to win a pennant a team needs above average performance (just by definition), and so above average performance squeezed into a small number of years is more valuable than an equivalent amount of performance stretched out into more years. But I don’t think it’s so much more valuable that it means that someone who’s career was basically four really great seasons, a few in which he was starting to deal with injuries, a few as a relief pitcher, and then an early retirement, is a top-20 pitcher. Now, I said that this may be a matter of taste. I’m inclined to think that when ranking baseball players what you want to rank is how much they did for their teams, given what they could control (this last qualification ensures that we don’t put much emphasis on RBIs when evaluating players, something based on linear weights is much better). Now, as I’ve just argued, measuring “how much they did for their teams” is not just a matter of multiplying their rate of production by their opportunities, putting more production into smaller spaces is more valuable than stretching it out. But a lot of people seem to think that what “greatness” amounts to isn’t “how much they did for their teams” but also “how good they were at their best”. Of course I account for that too – since, as I said, being really good for a little while is more valuable than being pretty good for a long time – but they want it to be something that doesn’t reduce to the value that a player contributes to his teams. I don’t know if this is what Albright is doing, but it wouldn’t surprise me. Let me argue, very briefly, that this is a bad idea. First of all, the only reason to care about how good a player is, is that it helps his team win ball games. We want talented players because we want wins, the value of great performance itself is instrumental. So if you give a player credit for his great performances, you’re double counting; he gets credit for a great performance (which, remember, matters because it helps his team win games), and he gets credit for the wins that that performance generated for his teams. My second complaint is that “at his best” is objectionably imprecise, and the only non-arbitrary way to make it precise is to extend it out to his entire career. Is it his best game that counts? His best week? His best year? His best X years? And, for any answer that you give, you need to give a non-arbitrary reason why that’s the timeframe that counts. Stretching the timeframe out to his entire career has a non-arbitrary reason – there’s nothing else that we could take into consideration. But there’s no non-arbitrary reason to stop short of that. So I’m not inclined to look favorably on players like Sugiura, guys who were exceptionally great for a short while but without the surrounding bulk that we ordinarily expect from a hall of fame type career. This card sure looks like it belongs to JCM 33d. The only problem is that Engel associates this menko number with Inao. I see three possibilities: (1) there’s an error in the book, (2) it’s an uncatalogued variation, (3) it belongs to an uncatalogued set that is nearly indistinguishable from JCM 33d. I don’t know which it is. Option (1) is certainly possible: I’ve written things shorter than Engel’s book that were professionally copyedited and errors still snuck through. But it could also be (2), there are plenty of sets that re-use menko numbers. And of course what (3) has going for it is that there are still plenty of uncatalogued menko sets. So who knows. Most Japanese hall of famers have relatively little written about them in English. Some of them don’t have their own (English) Wikipedia pages. A few of them have almost no internet presence (in English) at all, short of a page of stats at Baseball-Reference and a line of commentary by Jim Albright. Wally Yonamine is an exception to this rule. A huge, glaring exception. Rob Fitts wrote an entire biography of the man. A book. In English. I will, I swear. But I haven’t. And time constraints being what they are, I don’t know when I will. Rumor has it that you get to read for pleasure when you’re retired. 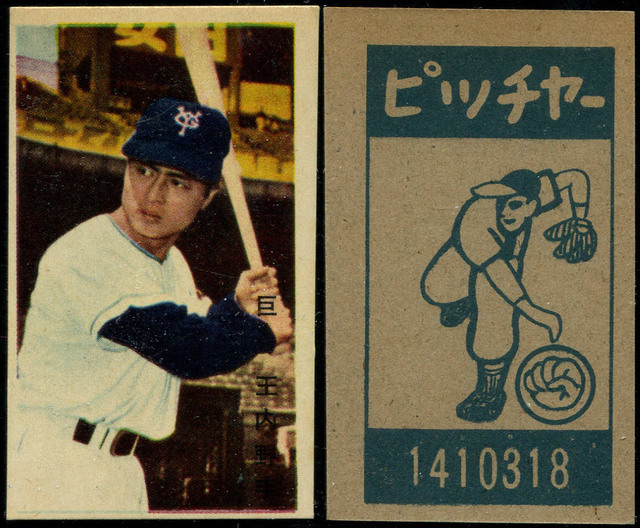 The point of this series of posts – for me at any rate – is that they give me an excuse to learn about Japanese baseball while collecting the cards. I can say at least something interesting and/or informative about the players that I’ve written up. But I also have cards of players for whom I haven’t done a post yet, and I don’t know much of anything about these guys. What team they’re on. What position they play. That’s about it. So it seems advisable to do an entry for Yonamine now, rather than wait until I’ve read Fitts’ book. Mostly because otherwise I wouldn’t invest the time necessary to learn something about him (albeit less time than reading a book). So I researched this post the same way that I researched the other ones: digging through the nether regions of Google searches, reading Whiting’s articles for the Japan Times, stuff like that. To those that have read Fitts’ book: I apologize in advance. You will probably learn nothing from this post, and might want to skip it. Although if you want to correct me on something, or elaborate on something that I don’t know enough about to address well, please go for it. We’ll start with this. Wally Yonamine played halfback for the San Francisco 49ers in 1947. That was the extent of his pro-football career. He totaled 114 yards in 12 games (just three starts). I don’t have any idea if that is good or not. I am the (perhaps rare) baseball fanatic who doesn’t care at all about any other sport. If the ball is going towards the other guys’ endzone, that’s good, if not, not. That’s all I know about football. But anyway, Yonamine was a latter day Jim Thorpe, or a forerunner to Bo Jackson. Which is to say, he played both professional baseball and professional football. His football “career” followed a brief stint in the army. After his discharge he chose to go pro immediately rather than accept a scholarship to Ohio State. A broken wrist following the 1947 season ended his time with the 49ers and dramatically changed the course of his life. As stories about Japan, and America, and baseball, are wont to do, this one features Lefty O’Doul. At the time he was managing the San Francisco Seals, a top minor league team. Yonamine had returned to his native Hawaii, where O’Doul apparently saw him playing baseball and signed him to a contract. He wasn’t assigned to the Seals though, they farmed him out to Salt Lake City in a class C league. Bottom of the totem pole. He hit .335 in a league that hit .269; I don’t have Yonamine’s other rate stats, but I think it’s safe to say that he utterly dominated the Pioneer League. O’Doul, of course, had many contacts in Japanese baseball, and recommended Yonamine to Matsutaro Shoriki of the Yomiuri Giants. Yonamine would spend the next 11 seasons playing baseball in Japan, nine of them with the Giants, the last two with the Chunichi Dragons. He was a fearsome baseball player. To modern eyes his stats look like those of an above-average leadoff hitter. And he was a leadoff hitter. But he was also, for his day, a terrific slugger. In 1956 (to pick one season almost at random) the Central League hit 225/274/321. Yonamine hit 338/420/487. That’s 50% higher than average in batting average, 53% higher in on-base percentage, and 66% better in slugging. To do that in the American League in 2018 you would need to hit 375/486/692. Those are a pretty good match for Babe Ruth’s career rates. Of course Ruth did this over a whole career, not just one season, so I’m not saying that Yonamine hit like Babe Ruth. He didn’t. But he did hit really damn well. And he, unlike most big sluggers, was also a fleet-of-foot outfielder. In 1956, the same year he was putting up Ruth’s career batting line, Yonamine tied for third in the league in stolen bases. Now, I’ll admit to being a little confused by this ground-breaking role for Yonamine. Tadashi Wakabayashi was also Hawaiian, and was playing in Japan immediately after the war. Yonamine wouldn’t arrive for another five years. Of course he’d been playing in Japan since 1936 – maybe Yonamine was the first American to start his Japanese career after the war. Maybe Wakabayashi didn't count since he'd been living there for so long? Anyway, it’s not like there weren’t any other Americans around in pro ball. As for introducing American-style ball to Japan, it sure seems that he should get credit (or debit, depending on who you talk to) for this. Prior to going over Japanese batters didn’t run out sac bunts, didn’t try to break up double plays. In general, they didn’t play aggressively. Yonamine did, and it worked. And he was soon copied. This didn’t sit well with the old guard (especially Kawakami, Yonamine’s teammate and the man who became his manager and engineered his trade to the Dragons). I wonder what happened the first time he took out an infielder turning a double play. When I played baseball, we ran drills to do that. Shortstops and second basemen also ran drills on how to avoid incoming runners who would go well out of their way to slide into them. Now, one day, shortly after I got old and started playing slow pitch softball, I was on first base when the batter hit a ground ball to the short stop. My old baseball training kicked in, and I executed a perfect take-out slide, smashing into the second baseman. This … didn’t go over well. There was shock and anger and much yelling. And a great deal of spilled beer. I like to imagine it was like that, some day in April of 1951, when Yonamine took out a Tiger second baseman. After retiring from baseball Yonamine spent many years as a scout, and a few managing the Dragons. He also started a business dealing pearls. Here’s a very 1980s video biography of Yonamine. My card is from the JCM 41 set, issued in 1959. I like this card because whoever did the background got carried away with the airbrush and erased his right hand. Minoru Murayama pitched for the Tigers from 1959 to 1972. He compiled a 222-147 record to go with a 2.09 ERA in just over 3000 innings. Although mostly a starter, he also made about 150 relief appearances. Offense was still low in the 1960s, but some of Murayama’s performances nevertheless stand out. As a rookie he posted a 1.19 ERA, and had ERAs below two in four other seasons. Towards the end of his career he was a player/manager, and he took over the Tigers again for a couple seasons in the late 80s. It is, of course, hard to tell which managers are good ones and which are bad ones (isolating their contribution from those of the players is really hard), but suffice it to say that the teams that he managed were unsuccessful. I always find it curious that league-wide strikeout rates don’t correlate very well with league-wide scoring trends. League ERA in 1962 was 2.63. Taking out errors inflate scoring, but it’s still low (RA9 is 3.09). But the league-wide K/9 figure is just 5.6. Murayama was well above that, but still striking out fewer than seven batters per nine innings. You see the same thing in America. Strikeout rates during the deadball era were very low. Intuitively you’d think that low run scoring environments would have high strikeout rates, since a strikeout can’t do anything to help a team score a run. The answer to this riddle is probably that what makes these environments low scoring ones is that batters are choking up and just putting the ball in play without trying to drive it. If you make sure that you put the ball in play you’re not going to strike out, but you likely will ground out to the shortstop. Anyway, Murayama was better than average at striking out batters, but his numbers, good in context, would be pathetic by today’s standards. Murayama won the college baseball championship (playing for Kansai). One must feel for players who faced him in college. While pitching for Kansai he posted an ERA of 0.91. When he went pro he was an immediate success. As noted, he had a 1.19 ERA as a rookie, and he also took home the first of three Sawamura Awards. Although Kaneda was clearly the better pitcher overall, at his best Murayama was his rival, and he tied Kaneda’s record of three Sawamura awards. (Although Murayama had to share one. In 1966 he and Tsuneo Horiuchi were declared co-winners.) Oddly, the year in which Murayama won his MVP award (1962) was not one of the years in which he took home a Sawamura (1959, 65, 66). His 2.09 career ERA mark is a Central League record, as is his career WHIP. The 0.784 WHIP that he posted in 1959 is an all-time single season record, which must have mightily impressed Japanese fantasy baseball players in the late 50s. Unfortunately, despite being a great pitcher the most famous moment in Murayama’s career was one of failure. In 1959 the Emperor of Japan attended his first baseball game. This was a Big Deal. The Tigers faced off against the Yomiuri Giants. Masaaki Koyama was the Tigers’ starting pitcher, but he was pulled in the seventh. Murayama was brought in to pitch in relief. In the bottom of the ninth, shortly before the Emperor was due to leave the game, Shigeo Nagashima hit one of Murayama’s pitches for a game winning, walk-off home run. He was a rookie, and would go on to have an extremely successful career. But, here’s an indication of how much of a Big Deal this was: sixty years later an American is devoting an entire paragraph to it in a short biography of Murayama. For the record, Murayama claimed that the ball was foul. Here is what looks to me like a video retrospective on his career. The voice-over is in Japanese, and so are the subtitles, so some guessing is involved on my part. It looks like it include Nagashima’s home run, and then it’s got Murayama striking out Nagashima several times, and a much older Murayama striking out Oh to finish the clip. My card is an uncatalogued menko. Since Murayama spent his whole career with the Tigers, and I’ve never seen any other cards in this set, I don’t know what year it was issued. In size and shape it is similar to the pillar menkos of the late 40s and early 50s, but obviously it’s newer than that (since Murayama didn’t break in until 1959). I suppose it could be one of those unauthorized menkos from the 70s (like my Takagi card), but it looks older than that. Conclusion: I don’t know what it is. Yasumitsu Toyoda spent 17 years playing shortstop for Nishitetsu (the Lions) and Kokutetsu/Sankei (the Swallows/Atoms), from 1953 to 1969. He was a power hitter who also had good speed when he was in his early 20s. Superficially he looks like a fast version of Cal Ripken (without the streak), but in context he was actually a better offensive player. He was one hell of a batter, slugging around .500 in leagues that averaged around .300. For a comparable American player I guess I’d go with someone like Alex Rodriguez. Unfortunately, he didn’t last as long as Rodriguez. Although he played until he was 34, Toyoda was basically done as a full-time player at age 29. The last few seasons of his career he played sparingly, apparently often appearing as a pinch hitter, if his game and at bat totals are to be believed. Given the propensity of Japanese stars to go on to have managerial careers, you might think that he few appearances were a result of transitioning into management. But no, Toyoda never managed even a single game. He did serve as a coach in 1968 and 69. Perhaps that accounts for his low number of games played in those seasons. Albright ranks him as Japan’s greatest shortstop, the Lions’ second-greatest player (behind Inao), and the fifteenth greatest Japanese player ever. There is one area in which the comparison with Rodriguez breaks down rather dramatically: fielding. When he was young Rodriguez was an excellent fielder. (It was a terrible waste of resources for the Yankees to move him to third. Jeter had slow reactions times but good speed. They should have kept Rodriguez at short and moved Jeter to centerfield to take advantage of his greatest strength and hide his greatest weakness. Bernie wasn’t such a great fielder that it would have been much of a loss to move him to left.) Toyoda, on the other hand, was an atrocious fielder. Tokuji Kawasaki, a pitcher for his team, reportedly tried to induce batters to hit the ball anywhere but to short. Nevertheless, he was selected to the best-nine six times, and made the all-star team nine times. During Toyoda’s time with them the Lions were extraordinarily successful. They won the Japan Series each year from 1956 to 1958, and Toyoda captured the Japan Series MVP in 56. After retiring Toyoda served as a TV and radio commentator. Word on the internet is that he’s also an author, although I have had trouble finding anything that he wrote. One book comes up on the English Amazon page for him, but the title doesn’t suggest anything about baseball, so I may have the wrong “Yasumitsu Toyoda”. The Japanese Amazon page, as near as I can tell, also doesn’t have any likely hits for either ‘Yasumitsu Toyoda’ or for ‘やすみつ とよだ’. He does appear to have made a cameo in a couple baseball movies, in 1957 and 1977. Not sure of his role (he’s credited as “Batter Toyoda” and “Coach Toyoda”), but he’s got his own IMDB page. And it is the same “Yasumitsu Toyoda”, I checked their birthdays. The card is a menko from the JCM 69 set. Released in 1959. Someone wrote what looks to me like the hiragana symbol for ‘ya’ on the back. No idea why. After retiring Toyoda served as a TV and radio commentator. Word on the internet is that he’s also an author, although I have had trouble finding anything that he wrote. I don't think he wrote any books, but he had a regular column in the magazine Shukan Baseball and also in the Nihon Keizai Newspaper until 2013, which is probably what that is in reference to. Tetsuharu Kawakami was a first baseman (and briefly a pitcher) for several incarnations of the Giants from 1938 to 1958. Appropriately nicknamed ‘The God of Batting’, Kawakami was a devastating offensive force. In 1939, at the age of 19, he hit .338 in a league that hit .224. That’s 51% better than average, for those keeping score at home. His OBP was 27% better than average, and slugging 71% better. To pull that off in the 2018 American League you would need to hit 377/403/713. (Look at that slugging percentage!) Kawakami’s career rate stats are excellent, his counting totals are good. He cleared 2000 hits comfortably, but managed only 181 home runs. Some years he was hitting nearly 30, others he was in single digits. He seems to have been injured in 1951 (during what would have been his best year) and his power never came back. I wonder if he had a back or wrist injury, something notorious for sapping power and not healing quite right. Albright says that the change resulted from a conversation with Ted Williams, in which Williams suggested aiming for more line drives instead of selling out for so much power. The conversation reportedly happened during 1950, however, and in 51 he was the same power hitter that he had been the previous few years. It wasn’t until after his abbreviated 1951 season that his output changed. During the war (1943-45) Kawakami served in the military, spending his time as a drill sergeant in the Imperial Army. He did not see battle. During the postwar period Kawakami was Oshita’s rival. Oshita used a bat painted blue. Kawakami painted his red. As a young man Kawakami was a pitcher. The 1939 Kyojin had a pitching staff that was something else. The old man of the staff, 23 year old Victor Starfin, threw 458 innings. Fellow hall of famer (and 19 year old) Hiroshi Nakao threw 224 innings. Kawakami (also 19 years old) threw about 100. Yasuo Kusunoki filled out the staff, pitching 70 innings at a respectable 2.17 ERA. That’s three hall of famers and a guy with an ERA just a nose above two. Kawakami is one of the rare men who has two separate compelling cases for the hall of fame. In addition to being a great player, he was the manager of the ON Cannon Yomiuri Giants who won the Japan Series nine consecutive times (and 11 total). He spent fourteen years at the helm of the Giants, from 1961 to 1974. During that time the Giants compiled an astounding .591 winning percentage. By way of comparison, that’s in the same neighborhood as Joe Torre’s winning percentage as manager of the Yankees (.605 over 12 seasons) and Bobby Cox’s winning percentage with the Braves (.576, admittedly over a longer period of time). Kawakami’s managerial style was notoriously brutal, and serves as an embodiment of the traditional Japanese style of training that some recent stars (most notably Hiromitsu Ochiai) rebelled against. Robert Whiting describes Kawakami’s managerial philosophy as combining “Zen Buddhist principles with Machiavellian tactics”. The reference to Zen Buddhism is meant in all seriousness, Kawakami was a devoted practitioner, crediting its influence with his extremely well-developed ability to concentrate (most notably on the ball), and eventually his success as a player. As a manager he demanded that his players be dedicated to their craft with the same intensity that he was dedicated to his. Kawakami seems to have been a traditionalist in a number of ways. He was one of the chief proponents of the restrained style of ball that dominated the early years of professional Japanese baseball (and, I assume, pre-war amateur baseball as well), and ended up clashing with his teammate, Wally Yonamine, on this issue. When Kawakami finally took over managerial duties, he engineered a trade of Yonamine to the Dragons, but the damage (as he saw it) had been done. Kawakami’s managerial style, and practice regimen, had followers long after he retired* but his style of actually playing baseball did not. I wonder if his nickname is a play on his real name. ‘God’ in Japanese is ‘kami’ (so much I remember from my high school Japanese class). The kanji for ‘Kawakami’ is ‘川上’. The latter symbol means ‘up’, and makes up a part of the word for heaven, superior, and, according to Google, supreme being. Maybe he was nicknamed ‘The God of Batting’ because his name (when pronounced) has the word ‘God’ in it, and (when written) has a part of it? For what it’s worth Wikipedia says that his nickname was spelled ‘打撃の神様’. But anyway, his nickname is a pretty good one in English, it might be even more clever in Japanese. For a much better biography of Kawakami, see the Japan Times article by Robert Whiting linked above. This clip is only four seconds long, but here’s Kawakami taking a swing. As for the card, I don’t know what set it’s from. On the front it looks like lots of “tobacco style” menkos, but it’s blank on the back. Some sets are sort of hybrid menko/bromides. This card probably belongs to one of those. The front has a familiar menko design, and it’s printed on menko-style card stock (my bromides tend to be noticeably thinner). But it doesn’t have a menko number, nor a rock-paper-scissors symbol. So I guess it leans closer to the bromide end of things than the menko end. Anyways, I like it for the solid red background. Last edited by nat; 10-16-2018 at 08:11 AM. Nat, would like to commend you on your research. Really enjoy seeing your cards and the write ups on each player. I do not believe your card is from a catalogued set, at least not in Engel’s first guide (waiting for my thumb drive copy of the second). The text box on this Suguira card is highlighted in black and none of the sets in the JCM 33 series indicate a black text box. Nor do any of the other Yamakatsu sets have that style of text box. Hmmm. At first I thought you had a Marusan card but for the back. Anyway, you appear to have a unique example there, congrats! And thanks again for the thread! Hi Keith, glad you like the thread, and thanks for pointing out that my Suguira card can't be from JCM 33. There are so many menko sets still to be catalogued. I'd considered putting together a website to crowdsource checklists for uncatalogued menko sets, but then I realized that that would entail a fair amount of work, and I remembered how lazy I am, and decided against it. I also don't know how many people would be interested in contributing. Anyway, for you today I've got one of the more obscure hall of famers (at least, obscure for a professional player; the executives and some of the amateur players probably blow this guy away for obscureness). Katsumi Shiraishi was a shortstop for 18 seasons. He came up at age 18 in 1936 with the Kyojin, leaving them only for the war in 1944. In 1946 he returned for only one season with Pacific team. 1947 was again a lost year. He spent it in the industrial leagues. It seems odd that a veteran player of his caliber didn’t have a pro contract. Anyway, upon returning in 1948 he spent two seasons with Yomiuri, and the balance of his career with his hometown Hiroshima Carp. He joined the team for its inaugural year and hit the first homerun in Carp history. Shiraishi was a strong hitter in a league with absolutely no offense. In 1942 the league hit 197/285/244. That’s right, the league as a whole was below the Mendoza line. There was a huge amount of variation, however. The Kyojin hit 231/342/299, whereas the Yamato team hit 181/271/217. Shiraishi himself hit 236/353/278. He had excellent on base skills, and decent power. His performance relative to his league would be the same as hitting 300/398/473 in MLB in 2018. At his peak Chase Utley was better, but they were the same kind of player. (Incidentally: Chase Utley was a legitimately great player, and I fully expect hall of fame voters to fail to recognize his greatness.) In addition to being a good hitter, Shiraishi was reasonably fast, stealing 20 or so bases per season when he was young, and 15 or so as an old man. And he was renowned for his defense. His counting stats are not impressive – 1500 or so hits, 81 home runs – which is to be expected for someone who played in short-season low-offense leagues. For his career Shiraishi’s on-base percentage is higher than his slugging percentage. This almost never happens in MLB. (Not never never – Brett Butler pulled it off – but it’s extremely rare.) As you might expect, Shiraishi walked quite a bit. About 50% more than he struck out. After retirement he managed the Carp for several years. They were not successful. He was known as a strict no non-sense manager, and one who was fond of small-ball tactics. This bromide is from the JBR 75 set, issued between 1948 and 1949. 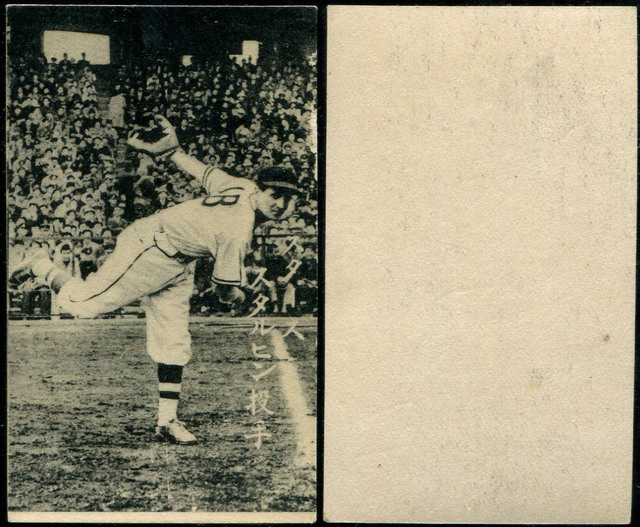 That means that this card is from the brief post-war period in which Shiraishi played for the Giants. Last edited by nat; 09-17-2018 at 07:51 AM. I am glad you posted the information on Katsumi Shiraishi. I just got one of his cards about the same time as your post. You got a 2-for-1 on that Shiraishi card, with Wakabayashi on the back. I wonder why they used an image of Shiraishi's back? Today's player is a pitcher from the 1950s. Ryohei Hasegawa was a sidearm and submarine pitcher for the Hiroshima Carp from 1950 to 1963. He had a losing record: 197-208. The Carp were not very good. In 1956 they went 45-82. Hasegawa won 22 games for them. In 1955 they were 58-70, and Hasegawa won 30 games. In 1972 Steve Carlton famously won 27 of his teams 62 victories. That’s pretty good, but not even Carlton can claim to have notched more than half of his team’s victories. As seems to have been common for aces at the time, Hasegawa threw an incredible number of innings. He pitched 348 innings as a rookie, and went as high as 387 in 1955. Immediately after that season of very heavy work his appearances dropped precipitously. One suspects injuries were involved. Again, this seems to have been very common for aces of the period. Perhaps teams would have gotten more value from their ace pitchers if they hadn’t pushed them quite so hard. Hasegawa was done at age 33, and the injuries seem to have taken their toll by the time he was 28. Of course any pitcher can get injured (and plenty do), but Japanese teams of the 1950s seem to have worse luck with this than most. Although his career was short, due to the heavy workload he did manage to pitch 3300 innings. His career ERA of 2.65 is not outstanding given the relatively low run environment of the day. (It seems to be around league average for many of the years that he was active.) Albright thinks that he was better than that though. Hiroshima had a terrible offense, and a terrible defense. Albright says that normalizing his performance to account for the poor defensive club behind him would show that he was significantly above average for his career, despite his disappointing superficial numbers. Hasegawa was a small man (listed at 123 pounds), without much on his fastball. His specialties were movement and location. If he’d been left handed it would be tempting to call him “crafty”. (For some reason “crafty lefty” is a thing whereas “crafty righty” is not.) He threw sliders, and sinkers, and a shuuto. The Carp’s struggles were understandable. Unlike most Japanese teams, they weren’t controlled by a corporation, and so didn’t have deep pockets to draw from; at one point they kept the lights on through public subscription. One reason that Hasegawa is notable is that the Carp faced contraction during his tenure, but they played just well-enough (and almost certainly wouldn’t have had he not been on the team) to keep the team off of the chopping block. It wasn’t until 1968 that they got a sponsor. My Hasegawa card is from JCM 33e, issued in 1959. Last edited by nat; 09-17-2018 at 08:59 PM. I am glad I posted my card. Thank you for the heads up on the 2nd player on my card. I suspect that Hideo Nomo isn’t in the hall of fame for what he did on the baseball diamond. Don’t get me wrong, he was good, but that’s not what he’s being recognized for. Nomo pitched only five seasons in Japan (all with the Kintetsu Buffaloes). He was remarkably good at the beginning of his career, posting ERAs of 2.91, 3.05, and 2.66 in his first three years. In 1993 his performance dropped off (he was slightly below average), the following year offense exploded in the Pacific League, but Nomo’s ERA was about the same as it had been the previous year, so in context he was quite a bit better than average. As a rookie, Nomo was a huge success. He won all of the post season awards. But it was what happened during the 1994/5 off-season that won him fame. He retired. Now, of course he’s not the first player to have retired, but he was the first to realize that if he retired from Japanese baseball he wouldn’t be bound by their reserve clause anymore, and so could declare himself a free agent. Not that any Japanese team would sign him – becoming a free agent in Japan isn’t that easy. But the Dodgers would (and did) sign him. The honeymoon didn’t last though. Nomo was good in 96, about average in 97, and traded to the Mets in the middle of 98. He had two more good years for the Dodgers in the early 00’s, but he spent most of the rest of his career bouncing from team to team in MLB, not being especially effective for anyone. At the age of 39, after having missed two years of baseball, he tried to make a comeback with the Royals. It went about as well as a 39 year old’s comeback with the Royals, after having sat out two years, should be expected to go. The Golden Player’s Club counts performance after a player has left Japan, and Nomo totaled just barely north of 200 wins for his career, adding Japanese and MLB totals. Hence, he’s a member of the club. But there is an element of apple-and-oranges here. The MLB season is longer than the Japanese season, so Nomo had more chances to pick up wins than a pure Japanese player would have had over the same number of seasons. If it had been my call, I wouldn’t have put Nomo in the hall of fame. His Japanese career was too short, and his American career wasn’t good enough to be worth much in the way of extra credit. My first thought for an American player who would be comparable to his JPPL+MLB career was Dave McNally. That’s not fair to Nomo though, McNally’s American career was only a little better than Nomo’s. Maybe someone like Sam McDowell would be a better comparison. McDowell was a star, but nobody’s idea of a hall of famer. Sabr has a long Nomo biography. My card is from the 1992 BBM set. Nomo was already a star at this point, but still only 23 years old. Katuso Osugi was a slugging first baseman from 1965 to 1983. The first part of his career he spent with the Flyers/Fighters, and the balance of his career with Yakult. As a player, he’s a familiar type. He hit home runs, didn’t run fast, and played a defensively-unimportant position. Speaking of home runs, he totaled 486 for his career, topping 40 each year from 1970 to 1972. To go with a career slash line of 287/350/519. Osugi started his baseball career in the industrial leagues, playing for the Marui Department Store team. A workout with the Flyers got him his first pro contract. He was selected to five best-nines, all of them before leaving the Flyers. (The Flyers play in the Pacific League. When he moved to Yakult he also switched leagues, and someone named ‘Oh’ had the first base slot on the best-nine team locked down for the Central League.) However, he did win the Japan Series MVP award in 1978, en route to the Swallows’ first ever Japan Series championship. It turns out that the Buffaloes aren’t the only team named after one of their players (Shigeru Chiba, in their case). The Fighters are also named after one of their players. The story goes that the team had a contest to pick a name (to replace ‘Flyers’), and the winning entry suggested naming the team ‘Fighters’ in honor of Osugi’s fighting spirit. And then they traded him the next year, but whatevs. Luckily the internet didn’t exist yet, or else they would have ended being the Nippon Ham Baseballteam McBaseteamface. Albright considers him the sixth-greatest Japanese first baseman, and 25th greatest player overall. Osugi’s batting style involved, he said, “hitting towards the moon”, about which Albright dryly remarks “I gather [it] involved uppercutting”. My card is from the 1979 Yamakatsu set. My main source for Calbee cards has dried up, so I’ve had to start looking for other manufacturers for post-1960s cards. For what little it’s worth (=probably nothing, since there are only two graded examples total) this is the only PSA 10 1979 Yamakatsu Katsuo Osugi. It’s my first Yamakatsu card; it has a nice bright image and a few basic stats on the back. You can tell from the mylar shrink wrap in a standard holder that it’s about the size of the 1980s Calbee cards. Unfortunately, the slab has a crack in it (along the bottom). Given how thinly collected Japanese cards are, it’s probably not worth re-holdering. (To give you an idea, Robb Fitts has the only 1978 Yamakatsu PSA registry set. There aren’t any 1979 registry sets.) I might liberate it from its tomb, to allow it its rightful place in my binder. But, given all the talk of how picky PSA is with their high-grade cards, it also seems like a shame to give up an official Gem Mint designation. Edit: And I'm at 66% now. Last edited by nat; 09-26-2018 at 07:54 AM. Tetsuya Yoneda spent 22 years pitching, mostly for the Hankyu Braves. He broke in as an 18 year old in 1956, and pitched until 1977. Only the last couple seasons did he appear for any team besides Hankyu. Over the course of those 22 years he managed to become one of Japan’s winningest pitchers (#2 in fact, behind Kaneda), with a career record of 350-285. (I assume he’s also one of Japan’s losingest pitchers.) As one might expect from someone who pitched for 22 years and won 350 games, his career innings pitched total is quite impressive, at 5130. That figure would put him 11th all-time in MLB, between Grover Cleveland Alexander and Kid Nichols. Incidentally, his win total would put him 10th in MLB history, below Roger Clemens and above Tim Keefe. Early in his career he was a strikeout monster, but dropped to only above average in K rate shortly thereafter. His raw totals make it look like his ability to strike out batters steadily degraded as he got older (which wouldn’t really be a surprise), but this is actually an artifact of changing context. Apparently batters just started putting more balls in play. Due to an above-average ability to strike out batters, and an extremely long career, he is second all-time in strike outs (although he is way behind Kaneda for the lead). One thing that he can’t blame on league context is his reduced workload over the years. Early on he was pitching ~300 innings per year, but 1970 was the last season in which he threw more than 200 innings, and he was largely a relief pitcher for his last couple seasons. Seaver-like his career started with controversy. The Tigers signed him out of high school, but Hankyu complained that the contract was invalid (on grounds that are unclear at the moment). The league ruled in their favor. And so although the Braves missed out on Seaver, they did get Yoneda. Or something like that. Probably the biggest problem that Yoneda ran into is that Hankyu was not especially competitive for the first half of his career. Despite good pitching, the offense couldn’t hold up their end of the bargain. In 1959 he had a 2.12 ERA and still lost 24 games. In the mid-60s they had something of a rebirth, however, and he ended up appearing in the Japan Series five times. They lost all five. Albright has him ranked as the 15th greatest Japanese pitcher, and 75th greatest player over all. I’m inclined to think that he rates peak performance too highly, there’s a huge amount of value in being a good pitcher for 5000 innings. Now, my inclination is not exactly dispositive evidence, but if I was starting a team and had to choose between a pitcher that would go on to have Yoneda’s career, and one that would go on to have Hideo Fujimoto’s career, it’s not obvious to me that I would pick Fujimoto. Now, Fujimoto was clearly the more talented pitcher, but he also pitched only half as many innings as Yoneda. The MLB pitchers that Albright lists as comps are: Phil Niekro, Gaylord Perry, Don Sutton, Early Wynn, Robin Roberts, Fergie Jenkins, Steve Carlton, Bert Blyleven, Jim Kaat and Tommy John. This is a pretty good list. Before reading Albright’s article I had Niekro and Blyleven picked out as comparable major leaguers. Everyone who writes about Yoneda mentions his prowess with the bat. So I guess that I will too. Now, it’s not that he had a very refined hit tool. He seems to have been a “swing hard at anything near the strike zone” kind of hitter – the pitcher version of Adam Dunn – but he did (like Dunn) have good power (for a pitcher). He totaled 33 home runs, including multiple seasons of 4 and 5, to go with a Dunn-like .171 batting average. His bat was sufficiently well-respected that he made 22 appearances at positions other than pitcher. The card is a menko from 1960. The set is JCM 12e. Junzo Sekine was a two-way player. Early in his career he was a pitcher; from 1957-on he was an outfielder. From 1950 to 1964 he played for Kintetsu, 1965 was the last year of his career, and he spent it with the Giants. The switch to the outfield was probably a good idea. In 1957 his OPS was 100 points above league average – that’s 16%. It would be like having an 850 OPS in today’s American League. Basically, in 1957 he was Nelson Cruz. He totaled 1137 hits, 59 home runs, and a 279/336/372 slash line. As a pitcher he had his moments, but was really only above average in 1954; the rest of the time he was a middle of the road starter. Sekine was a star at Hosei, and was recruited to play for Kintetsu by their manager (and his former manager at Hosei). One of his claims to fame is that he was selected to the all star game as both a pitcher and an outfielder. Albright does not rank him on his list of the top 114 Japanese players, and says that he thinks that he doesn’t belong in the hall of fame. I agree. Because he was a two way player there really aren’t any American comps. He’s no Babe Ruth, and even John Ward was better than he was. He had one above average season as a pitcher (and a bunch of average-ish seasons), and then a run as Nelson Cruz. That’s a nice career, but it really doesn’t add up to being a hall of famer. After retirement he spent a while as a manager, helming the Whales from 1982-4 and Yakult from 87-89. None of his teams had a winning percentage above 500. However, if Wikipedia is to be believed, he was instrumental in helping Sachio Kinugasa develop as a batter. He was the hitting coach for the Carp in 1970 and reportedly forced Kinugasa to practice long after everyone else had left the field – including catching him coming home from carousing with his friends at 3am and forcing him to practice until daybreak. Now it’s certainly possible that there’s some player who is good at both – Babe Ruth did exist. But if there are a bunch of players who are good at both, it’s likely that they’re not being drawn from the far right tail of the hitting distribution, or from the far right tail of the pitching distribution, or both. More likely is that their skill level is closer towards the mean. (I am assuming that these skills are normally distributed, that is that the distribution makes a bell curve. Hence the “far right tail” is the small number of people who are really good, and the mean is the top of the bell.) Which is all a long-winded way of saying that if a league has a bunch of people who are good pitchers and good hitters, it is likely that the level of play in the league is pretty low. If all this is right, and if hitting and pitching skill is normally distributed, it means that the pipe-line that fed Japan’s early pro leagues wasn’t very efficient. There were probably guys who were better hitters or better pitchers than the people playing pro ball who, for one reason or another, never got a chance. The card is from JCM 123. Its date of issue is uncertain, either 1950 or 1951. If the former, then this is Sekine’s rookie card. Atsushi Aramaki had a 13 year career, pitching mostly for the Orions. He pitched from 1950 (at age 24) through 1962. While the inning totals that he posted were certainly healthy, he didn’t put up the quantity of innings that other star pitchers of his day did. As a rookie he pitched 274 innings, and he never again topped that mark. Several times he would have been among the league leaders in rate stats, but he didn’t pitch enough innings to qualify. Nevertheless, he was effectively finished in 1959, pitching a total of ~60 innings during his last two seasons with the Orions, and making two nominal appearances for the Braves. On a rate basis his career numbers are good. Aramaki posted a 2.23 career ERA, which is a very nice mark even in a league with a collective ERA well below 3. (It’s 8th all-time.) Because his career was so short, and his innings pitched per season were not on a par with his contemporaries, his counting stats are unimpressive. He totaled just 173 wins (although he lost barely more than 100 games, so his winning percentage is quite nice), pitched 2200 innings, and struck out barely more than 1000 batters. Injuries must have been a large part of Aramaki’s story. It’s hard to believe that the Orions would have coddled him when Inao, Kaneda, and so on, were being forced to pitch 7,000 innings per season (approximately, number may be exaggerated). It’s also the only plausible explanation for the sudden cliff that he fell off. Absent a major injury, players have some ups and downs as they get older, and in general see their production drop off steadily. Aramaki suddenly lost it. Like Roy Halladay. Like Brandon Webb. Like a million other guys who felt something pop in their shoulder and suddenly couldn’t get the ball to move any more. This is speculation on my part (although Albright, who ranks him as the 103rd greatest player, thinks along the same lines as me), it’s not like I have a report of an injury, but it is also the only plausible explanation. The card is from JCM 129, issued in 1958. Cards from this set generally feature two players, one action shot, and a headshot of a different player. Aramaki is the guy pitching. The headshot is of an unidentified member of the Hawks. The word always used to describe this set is ‘garish’. And it’s the right one. This is one ugly set. The backs are variable, so the set designers weren’t making any statement about Aramaki by paring him with the ace of spades and the atomic bomb. One thing that I do like about this set is that it’s printed on thick, high-quality card stock. There are lots of “menko” cards that are printed on glorified flash cards, you couldn’t possible flip them over or flip anything over with them. 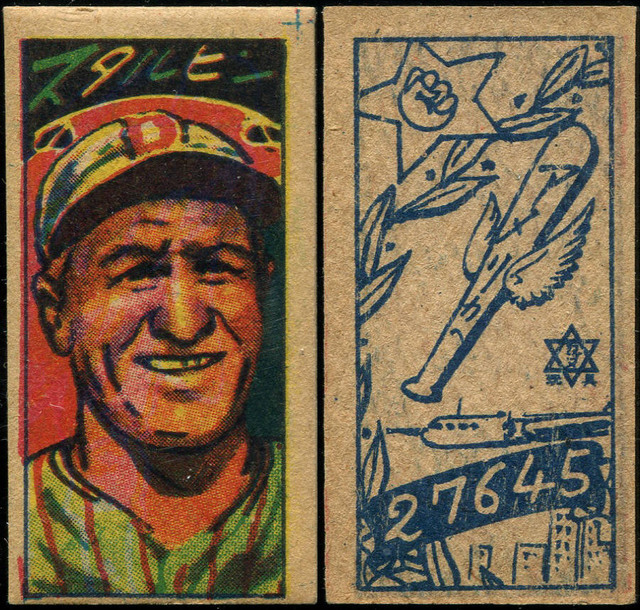 The card stock on the JCM 129s, however, is more like what you’d find on a Goudey. A very satisfying card to hold. But my most favorite thing about this card is that they were really really really not messing around with that menko number. Statistically, what is most noticeable about him was his ability to strike batters out. When he was young his strikeout rate was almost double the league average. That’s… that’s not something you can really do today. To double the league K rate in the 2018 AL you would need to strike out 17 batters per nine innings, which is something that no one has ever done. Gerrit Cole led the AL this year with a mark a bit above 12. Which is remarkable in its own right (especially considering that he’s a starting pitcher), but nothing like what Nakao was doing. He finished with a 209-127 record – which is good – and would have done much better if he hadn’t lost the heart of his career to the war. Which, as tragedies resulting from WWII go, is pretty low on the list, but it’s still regrettable. He served in the army, but I have been unable to determine whether he ever saw combat. With some very notable exceptions, prominent American ball players mostly did not. Likewise, I have found a suspiciously high percentage of Japanese players that were given not-very-dangerous postings (of course these things are relative, given how thoroughly the Japanese main islands were bombed, even civilians were in considerable danger), so there may have been some element of favoritism going on in the Japanese military as well. Although, as Eiji Sawamura can attest, not as much as in the American military. As might be expected from an extraordinary strikeout pitcher, he was also extremely wild. He once threw a no hitter despite allowing ten baserunners on walks and hit batsmen. (It was the fifth no hitter in JBL history.) His walk totals were regularly among the league leaders. Nolan Ryan was the Platonic form of this kind of pitcher. Notice that despite all the no-hitters, Ryan never pitched a perfect game. A Nakao/Ryan comparison isn’t apt, however, because Ryan was basically indestructible, whereas Nakao was very destructible. His innings pitched totals dropped and his ERA rose dramatically starting in his late twenties, basically the opposite of Ryan. Actually, on second thought, it’s Nakao who is the Platonic form of the pitcher with a blazing fastball but no idea where its going. At least Ryan struck out more batters than he walked. That’s not something that Nakao can say. After retiring Nakao coached in the Giants’ system. As a coach he subscribed to Kawakami’s intense training philosophy, and he (and Kawakami) came in for criticism when a young pitcher (Toshihiko Yoguchi) had a nervous breakdown, was hospitalized, and died. Officially the cause of death was heart failure, but Whiting reports that an investigation by the Shuken Post concluded that it was suicide. By 1955 Nakao was the team captain of the Giants. I don’t know exactly what this means. In America its an entirely honorary post. In Japan its different than the team’s manager, but I don’t know what duties accompany it. Anyway, I discovered this tidbit in the 2/25/55 issue of the Kingston Gleaner. It contained an article about a goodwill tour that the Giants engaged in across South America, Jamaica, the D.R. and neighboring countries. Fun fact: this thread has made its way into Google’s algorithm. While researching this post I encountered one of my earlier posts in which I mentioned Nakao. Today’s card is from the JGA 19 set. The picture picked up every speck of dirt on the card, in hand it looks a good bit nicer than this picture. The card was distributed in the 1/1/52 issue of Shonen Club magazine. Originally it was a part of a 16 card sheet that was then cut into individual cards by the kid with the magazine subscription. Engel calls it a game card: above and below the picture of the player are printed the names of baseball plays. It is not clear to me that this is sufficient to make it a game card, how you are supposed to use the names of baseball plays to play a game is not exactly clear. My card is actually cut down quite a bit, as the names of the plays are completely gone. Engel says that this set has an R4 rarity, fewer than ten of each card known. Now, Engel's rarity classifications are not to be trusted, and I have no idea how many of these cards are out there. But it would make sense if they were pretty unusual. It’s not like you could stop into the store at any point all summer and pick up a wax pack of these. These cards were distributed with one issue of one magazine. Shosei Go had a long career, mostly in the outfield, for the Giants, Tigers, and Mainichi Orions. He broke in in 1937 and played until 1957. Oddly, after playing the thirties and early forties as an outfielder, he spent a considerable part of 1946 pitching. And then he went right back to being an outfielder. Especially when he was young, Go was a really terrific player. What stands out immediately is that he was fast. For example, he stole 54 bases in 84 games in 1943. That’s pretty amazing. To American eyes his stat line looks like that of a speedy leadoff hitter with good on-base skills, but given the environment in which he played (e.g., one with absolutely zero offense), he was actually terrific at every offensive aspect of the game. He had great on-base skills, to go with lots of power. He was hitting .300 in leagues that collectively had batting averages below .200. Even if you’re not hitting lots of home runs (and he wasn’t), that’s going to give you a lot more power than most of the people in the league. For that all-around skill set in a very weak league, it’s tempting to compare him to Ty Cobb. On the other hand, Cobb is a top-5 player all-time, and Go isn’t that. But they were both really fast, with really high batting averages (in context), and high slugging percentages that are due more to high batting averages than to lots of home runs. Other people you might compare him to have severe deficiencies in their cases. “A faster Kirby Puckett” came to mind as a comp, but Go was better at getting on base than Puckett was. Maybe “Rod Carew with more power” would give you the right idea, but none of these comps are really very good ones. Despite his power (or because of his speed) he was a leadoff hitter. He recorded a pair of batting titles, and led the league in stolen bases once. In addition, he was the 1943 MVP. As a pitcher he was above average. But he didn’t spend much time doing it. He was a more-or-less full-time pitcher in 1946, but he appeared in only four other games as a pitcher throughout the rest of his career. A casual perusal of the internet fails to yield an explanation as to why one of the game’s top position players would temporarily become a pitcher. His nickname was ‘The Human Locomotive’, and hails from Taiwan originally. If you count him as foreign-born he leads all foreign-born Japanese players in stolen bases. But considering that Taiwan was a Japanese colony when he was born, it’s something of a fraught issue. Albright regards him as the 45th greatest player in Japanese history, and the greatest outfielder of the one-league era (that is, before 1950). Finding a Go card took some patience. For whatever reason (maybe none?) I’d been looking for a Go card in particular for quite a while. The first one that I saw was a round menko, but it was being sold as part of a large lot that I didn’t want. This is only the second one that I’ve ever found; since I bought this one I’ve located one other, but didn’t need it any more. Part of the (apparent) scarcity of Go cards is due to the fact that he retired right as they started producing tobacco-style menko cards, which, in my experience, are far more common than other kinds of vintage Japanese cards. Engel has only one set listed from 1956, and only a couple from 1957. So he’s not in any of the really common sets. But there were plenty of pre-tobacco-style sets that he could have appeared in, so it may just be random variation that accounts for the fact that I’ve encountered relatively few Go cards. There aren’t many Japanese cards for sale period, so it wouldn’t take much to have an unrepresentative sample. In any case, this card is a bromide, from JBR 2. It was issued in 1950. At this point Go had a couple outstanding seasons left, but he was getting older and starting into a late career slide. Not that he ended up being bad exactly, he just declined from excellent to good. My apologies for the time between posts. Part of it is that I’ve been busy, and the last couple days I blame the World Series. I’ve also burned through most of my backlog of cards – I’ve got just a couple other hall of famers in hand that I haven’t written up yet – so pretty soon posts are going to have to wait until more mail from Japan arrives. There is a peculiar gift to making the familiar seem unfamiliar. J.K. Rowling’s platform 9 ¾ did it well (at least for those who frequent King’s Cross). Disaster movies play on this all the time: world famous streets, usually teeming with life, completely empty, famous landmarks toppled over. I don’t know if I’ve got what it takes, but I’m going to try. Hideki Matsui is one of the all-time greats. He is a fearsome slugger, who also posted on-base percentages north of 400 for seven years running. He broke into baseball as a raw 19 year old in 1993, slugging a modest 451. By the time he was 28 his slugging percentage was just shy of 700. That year he hit 50 home runs and he walked more than he struck out. In fact, look at this slash line: 334/461/692. Mike Trout has never matched any of those numbers, much less put them all up in the same year. To be fair, he was only one point off on OBP this year, but he’s never been particularly close to either of the other marks. And of course he’s never hit 50 home runs either. I don’t know whether Matsui got nicknamed ‘Godzilla’ before or after leaving Japan, but it’s apt. Throughout his 20s he was a monster, smashing his way through Tokyo. Or at least the Tokyo Dome. Matsui is a line-drive hitter, who has power to his pull side. A natural right hander, he nevertheless bats lefthanded. (This is surprisingly common. I guess it’s a good idea if you can manage it, but I can’t even imagine batting left handed.) His reputation as a tremendous player predates his professional career. He appeared in Koshien tournament four times, once drawing five (!) intentional walks in a single game. Statistically, the American player that he most reminds me of is Sammy Sosa. Matsui’s own transition to American did not go quite as well as expected – this is why “Hideki Matsui, all-time great” might seem odd to American audiences. Davenport suggested that >90% of his production would carry over to his new environs. That didn’t happen. It’s not that he was bad or anything. On the contrary, he’s got a World Series MVP trophy to show off. But he hit a total of 16 home runs in his first season (162 games!) in MLB, and his annual output topped out at 31. In Japan he was Sammy Sosa, in America he was, well, Hideki Matsui. After his age 38 season he hung up his spikes for the last time. In Japan he played for the Giants, in America he spent most of his time with the Yankees (and brief stints with the A’s, Angels, and Rays). The Golden Player’s Club counts production in MLB, provided that a player began his career in Japan prior to coming over, so Matsui gets credit for what he did on this side of the Pacific. Consequently, he is a member of both of Japan’s halls of fame. Post-retirement he has stayed in the US. He has a house in Connecticut, and is a roving minor-league hitting instructor for the Yankees. He's a clip of Matsui in action. My card is from the 1997 BBM set. Pretty much in the middle of his career in Japan. I’ll free this card from its case eventually. The case is cracked (and is BCCG anyway). I just haven’t gotten around to it. I appreciate the thread--I think. Didn't own any Japanese cards until a few days ago, until I won the three below-- an Oh rookie with two Starffins. Now I find myself searching through even more cards on Ebay. Nice way to start a Japanese collection! An Oh rookie is always nice, and I really like that bromide. Much though I adore menko cards, in some ways I like the black and white photography on bromides even more. When you said that you were new to collecting Japanese cards, my first thought was to direct you to Prestige Collectibles. But I see that that's not really necessary! Kazuhiro Yamauchi was a righthanded slugger who played for three franchises between 1952 and 1970. The bulk of his career, including all of the seasons in which he was a real star, were spent with the Mainichi/Daimai Orions. In 1964 he joined Hanshin, and the last three years of his career he spent with the Carp down in Hiroshima. Yamauchi’s best season was probably 1957 when, as a 25 year old, he put up a slash line of 331/451/621 over 126 games. The late 50s were not a super low offense era, like early Japanese baseball had been, but it was still a pitcher’s era. League-wide OPS that year was more than 400 points below Yamauchi’s mark. To match his 1957 production (relative to league average) in 2018’s NL, you would need an OPS of about 1200. That would rank 20th all-time in MLB, tied with Jeff Bagwell’s 1994. As for a comparable American player, I’d nominate a second-tier slugging hall of fame outfielder. Someone like Duke Snider. They’re both good power hitters with a little bit of speed. Snider struck out more than Yamauchi did though. In fact, Yamauchi walked more times than he struck out, which is quite an accomplishment for someone who was obviously swinging from his heels pretty often. Actually, if you ignore the positional difference, Bagwell isn’t that bad of a comp. In context, however, Yamauchi was probably a bigger star than either of those guys. He made 13 consecutive all-star games (and ten best nines). Bagwell was selected for the all-star game a shockingly low number of times for as great of a player as he was, and Snider, despite being a deserving hall of famer, was obviously overshadowed by the other two centerfielders in New York at the time. Yamauchi is top 20 in many offensive categories, and is top ten in doubles. Albright probably thinks that my Snider/Bagwell comparisons are hilariously wrong: he’s got Yamauchi ranked as Japan’s 8th greatest player of all time and the best outfielder of the 1950s. That’s more Ted Williams than Duke Snider. He did win an MVP award, although not for his best year. He missed out in 1957, but took home the hardware in 1960. Three years later he was dealt to the Tigers in a blockbuster challenge trade. The Orions got pitcher Maasaki Koyama out of the deal. Trades like this are fun but super rare: superstars being traded for each other. Usually when a superstar gets dealt, there are prospects or some larger package involved. Colavito for Kuenn, Frisch for Hornsby, that sort of thing. Post retirement Yamauchi spent a few years managing and many years coaching. He also has a company that sells sports equipment. The card is from the JCM 12d set, issued in 1961. It’s a pretty standard tobacco-style menko card. I decided to upgrade (?) my Kaneda card. Really, I have no confidence that this card is an upgrade, in any value or rarity sense, over my other one, but I like it better. Actually, I'm pretty sure it's a downgrade value-wise, as I paid more for the other one than I did for this one. Until picking up this card I'd resisted duplicating any players who I've already got. This keeps costs down, and keeps the collection focused. But I've also passed on a number of cards that I would have liked to have. Now that I've crossed this bridge, however, who knows if my self control will hold. It's from the JCM 69 set, from 1959. At this point Kaneda was 25 years old, in his 10th season, he'd won 31 games the previous year, and was right in the middle of the most impressive run of pitching in Japanese history. Kazuto Tsuruoka (neé Yamamoto) was a power hitting star infielder for Osaka. He only played in parts of eight seasons, a few of which were very part time. In 1939 he was a 22 year old third baseman who hit 285/403/407 against a league average of 224/315/288. That would be like hitting 313/407/568 in today’s National League. Pretty good. Imagine if Nolan Arenado had a somewhat higher batting average, and that his power wasn’t partially a product of playing in Colorado. That’s the idea. Yamamoto didn’t appear in another professional game for seven years. One assumes that the war got on the way. When he returned, as a 29 year old in 1946, his power wasn’t quite as good, but he was still a top player. Most of the time he was a third baseman, but he also played a significant amount of second base, and a little bit at first and in the outfield. Despite having a short playing career, Yamamoto was a 3x MVP winner. All of this, however, is really beside the point. Yamamoto is a special figure in the history of Japanese baseball not because he was a short-lived version of Nolan Arenado, but because he was one of Japan’s great managers. He was player-manager for the Great Ring/Hawks from 1946 through the end of his playing career, and continued to manage them until 1968, when he was 51 years old. His teams went 1773-1140 during his tenure. A 609 winning percentage would be perfectly respectable for one season: that was Yamamoto’s winning percentage over 23 years. Between 1950 and 1966 none of his teams finished below second place. He is the winningest manager in Japanese history. Despite his unparalleled regular season success, however, things did not go so well for Yamamoto during the post season. His teams made it to the post season on many occasions, and tended to lose the Japan Series to the Giants. Unlike Kawakami – whose Giants he would face late in his career – Yamamoto was not an advocate of the traditional (and grueling) Japanese training routine. Word is that he was widely respected by his players, not least by his American players, for whom Kawakami’s approach was not only grueling but also unusual and perhaps unexpected. 1946 was quite a year for him. He returned from the Army, led the league in RBI, became a manager (despite having only one season experience in professional baseball), won the MVP award, and his team won the championship. Albright gives him credit for the time that he missed in the military, and accordingly ranks him as the 63th greatest Japanese player. Without any war credit presumably he wouldn’t make the list at all (his playing career was quite short). Whether to give players credit for time that they missed in the military is a bit of a philosophical question. It’s a question of whether, when ranking greatest players you are recording what they did, how many games they helped their teams win, or whether you’re doing something else. I’m happy to admit that they deserve the credit, but if a ranking of great players is just a record of what happened, then, to quote Clint Eastwood, deserve ain’t got nothing to do with it. But anyways, it’s a common enough practice, and if you follow it then Yamamoto does pretty well. He was a really good infielder. The card is a blank-backed uncatalogued menko. Other than the shape (round menkos started to fall out of favor as the 50s progressed) I don’t have any indication of the year in which it was issued. Lefty O’Doul needs no introduction on a website dedicated to pre-war baseball cards. You folks know who this guy is, so I’ll keep this entry short and sweet. In many ways O’Doul was a baseball renaissance man. He pitched for the Yankees, won batting titles for the (New York) Giants, managed the San Francisco Seals for twenty years, taught or mentored Ted Williams, Willie Mays, Willie McCovey, and others, was good friends with Joe DiMaggio, served as a baseball instructor at the Big Six universities in Japan, led numerous baseball tours of Japan and the far East, scouted Wally Yonamine for the (Yomiuri) Giants, supervised the construction of the (Yomiuri) Giants’ stadium, and founded an iconic bar/restaurant in San Francisco. Many times I’ve heard people complain that Lefty doesn’t have a plaque in Cooperstown. But the part with the bronze on the wall is actually a pretty small part of the hall of fame; and while he didn’t have the kind of career that the (American) hall of fame tends to honor (he is, of course, in the Japanese hall), he absolutely had the kind of career (and life) that the museum it’s attached to likes to feature. It’s been 20 years since I visited the hall of fame, but I can only hope and assume that they have an exhibit on Lefty. The tours of Japan started in the early 1930s, and continued regularly until they suffered a geopolitical interruption. O’Doul is said to have taken the attack on Pearl Harbor as a “personal affront”. Nevertheless, he returned to Japan after the war and continued his involvement with Japanese baseball into the 1950s. He was instrumental in founding professional baseball in Japan. It was with in consultation with O’Doul that the original professional teams (and, in particular, the Giants, who are named in honor of O’Doul’s old MLB team) were founded. I think it would be fair to say that O’Doul is the patron saint of Japanese baseball. His American counterpart (if you will) would be someone like Harry Wright, although I get the impression that O’Doul is (or was) adored or revered in a way that Wright was not. I’m going to leave it with that. There are many more resources, all over the internet, giving details of the various tours. They’re comprehensive enough, and easy enough to find, that I don’t think I can do anything to add to them. Here’s a promotional video that the PCL shot in 1946. They’ve got Lefty taking some swings at around 2:40. I've (mostly) restricted this project to people who were great Japanese players, but I couldn't resist including O'Doul. My card is from the JRM 7 set, issued in 1949 in conjunction with a tour of Japan by the San Francisco Seals. And here are a bunch of other cards, curtesy of our own members. Yoshiyuki Iwamoto was an outfielder who played from 1940 to 1957, although he missed time both for the war and from 1954-5. He was both older and peripatetic. In 1940, when he got his start with Nankai, he was already 28. Over the next seventeen years he would also play for the Robins/Whales, and the Flyers. Iwamoto made his last appearance on the field (he continued to manage for several more years) as a 45 year old. When he first broke in, Iwamoto was offensively a little bit better than average, but nothing special. Since he was an outfielder – where more offensive is expected – one imagines that he relative to his position he was quite ordinary. Now, usually baseball players reach their peak performance around age 27 (this is especially true of position players, aging curves for pitchers are less predictable), so ordinarily you would not have expected Iwamoto to get much better. But he did. This could be random variation: not everyone follows the same aging curve. But it could also be due to his unusual development pattern. The standard aging curves were drawn up on the basis of MLB performance, and most MLB players spend a considerable amount of time in the minors before making it to The Show. Japan has the Industrial Leagues, but top players often go straight to the highest level. Now, Iwamoto did play in the Industrial League for three years, so he had an apprenticeship that many don’t get, but after he made it to the highest level he spent his entire first season sitting on the bench, and then (in 1939) he was drafted. His first really good season was his third, at age 30. Then he went to war. In 1949 he was working on getting his sea legs back, but in 1950 he really hit his stride. In addition to hitting his stride, he also hit baseballs. Lots of them. A really long way. His slash line in 1950 was 317/372/583. To go with those rate stats he scored 121 runs and hit 38 homers. In 1951 he was even better, hitting 351/448/628. The Central League in these years was not quite the pitcher-friendly league that Japanese players had grown used to, but it still featured less offense than today’s MLB, so Iwamoto was a huge slugger. The thing is, that was it for him as a star. His 1952 was respectable. He played in 1953. And then he made a brief comeback in 56-7. But his career as a great player lasted only two seasons. Finding comparable MLB players is really hard. Typically, if you’re good enough to be genuinely great, you’ve got more than four good seasons in your career, and your career is considerably longer than Iwamoto’s (considering the years that he spent as a part-time player). Although he’s certainly a special case, and not really comparable otherwise, Josh Hamilton comes to mind as a similar player. Power hitting outfielders whose skill quickly disappeared on them. Al Rosen is probably an even better comp. Players like this really don’t get into the American hall of fame. The Kirby Pucketts and Ross Youngs of the world aren’t quite in the same boat. Those guys were elected because the voters were dreaming about their potential, and they decided not to hold tragic circumstances against them. That’s really not what was going on with Iwamoto. He played until he was 45. There are some HOFers who are in the hall for the work that they did over a very short period of time – Ducky Medwick comes to mind – but outside of Koufax they still added considerable bulk to their careers. If you absolutely had to have an American hall of famer to compare Iwamoto to, I guess you go with Chuck Klein, but you’d do better with Rosen and forget about the hall. Outside of anecdotes, little is known about fielding in early Japanese ball. But Iwamoto was probably pretty good, or, at any rate, he had a strong arm. He set a record with eight double plays from the outfield; I do not have figures for outfield assists of other kinds. He was a player/manager, with heavy emphasis of ‘manager’ and not much on ‘player’ during his last two seasons, and after retiring from active duty continued to manage, first the Flyers and later the Kintetsu Buffaloes. His teams were terrible. Only one of them finished above 500, and his lifetime winning percentage is barely above 400. I’ll admit that I really don’t have any idea why Iwamoto is in the hall of fame. He was very good. For a minute. You can call the war an extenuating circumstance, but even so it’s hard to argue that he had the kind of peak performance – to say nothing of career performance – that we ask of hall of famers. Some players benefit from having managerial careers in addition to appearing as players, but presumably that only helps if you’re the skipper of a good team. All in all, a very perplexing decision to induct him. Juzo Sanada played 11 seasons, mostly for the Robins and the Tigers. He was a pitcher who played a non-trivial number of games at 3B late in his career. 1943 was his rookie year, spent with Asahi. As a 20 year old pitcher he was just about average, posting a 1.97 ERA in a league with a 1.94 ERA. (Yes, that’s how low-scoring early pro ball was in Japan. The league as a whole had an ERA below two.) Then the war interrupted his career. In 1946 he was back with Pacific, posting an ERA slightly better than league average. This would continue for the next few years. He was never more than 50 points better than league average, and never more than about 20 points worse. During his time with the Robins Sanada was usually his staff ace. They usually had Sanada pitching far more innings than anyone else on the team. I looked at the other teams in 1948 and this arraignment seems to have been unusual. Nobody was doing a strict rotation the way that they do now, but only the Stars had one pitcher (Starfin) whom they rode the way that the Robins were doing with Sanada. Everyone else split up pitching duties much more evenly. This went on until 1951, when Sanada had a very poor year. His ERA was well over five, in a league that averaged 4.41. By the start of the next season he was on the Tigers. I tried to figure out what happened. Baseball-Reference doesn’t give transaction information for foreign leagues, so I tried to reconstruct it. But it turns out that no one else played for both the Robins and Osaka between 1951 and 1952. I had hoped to find someone who went Tigers-Robins at the same time that Sanada went Robins-Tigers and so figure out who he was traded for. But it looks like he wasn’t traded at all. Maybe he was sold, maybe he was simply released. Anyway, the Robins’ lack of faith came back to bite them. In 1952 he posted a 1.97 ERA against a league average of 3.28. Pretty good. Although his innings pitched were down a long ways from what he’d been doing in the mid-to-late 1940s, by some measures it was his best year. At any rate, it was the year in which he was most effective. Things unraveled quickly after that. His innings pitched dropped further, he spent 1954 mostly pitching out of the bullpen, and he retired after 1956. Although Sanada was primarily a pitcher, he also played third base in 1954 and 56. Throughout his career he’d been a decent hitter – sometimes below average, sometimes above average, but the dude was a pitcher, so we can forgive him his below average years. In total he appeared in 65 games at third base. I think that his offensive performance can best be characterized as “okay”. Probably good enough to hold down a starting job, although he never got a chance. In 54 he played backup to Shinsuki Yogi at third (in addition to pitching). They were about equally good hitters. Yogi was out of the league the following year, but oddly Sanada didn’t appear in the infield in 1955. He returned in 1956, this time playing second fiddle to Hideshi Miyake. By this point Sanada was right at the end of his career and Miyake, who would go on to have a substantial career as an infielder, was just starting his. So that was that for Sanada. The high points of Sanada’s career were a pair of no hitters. In addition, he was named to two best-nines and won a Sawamura award. Albright ranks him as the 76th greatest player of all time, right behind Yoneda. This ranking seems to me to be… aggressive. Sanada was an adequate pitcher, and for one season a very good one. He threw a lot of innings per year, but (1) not all that many more than his competition, and (2) his career was short. It’s true that he was good enough with the bat to spend the equivalent of about a half season playing the infield. But he wasn’t that good with the bat, about average, so let’s not get carried away, and, moreover, there were a lot of good hitting pitchers in his day. Probably most notably his teammate Fujimura. As discussed in a previous post, this is probably an indication not that the baseball Gods walked the Earth in Japan in the late 1940s, but that the level of play was pretty low, and so guys who were generally good athletes were able to perform at a high level in multiple roles. Sanada looks like a rather poor choice for the hall of fame to me. The card is from the JCM 124 set, issued in 1950. The early days of Japanese baseball were a very low offense affair. I've often wondered why. Now, I was watching this video of Starfin pitching. Check out the stadium that you can see starting at 0:08. It has HUGE amounts of foul territory in the infield. Just unbelievably enormous, the fans were sitting miles away from the action. It looks like the stadium wasn't originally designed for baseball. Anyway, if that was anything close to normal then it would go at least some distance towards explaining the low run scoring environment. Having distant fences decreases home runs, but it increases doubles and triples, so it doesn't necessarily reduce scoring. But large amounts of foul territory does: all that leads to is more foul outs. I tried to figure out which stadium this is. Google tells me that the caption at the top says "All Japan vs. Tools, 1949", but I'm pretty sure that should be "Seals" and that this is footage from the Seals' 1949 tour. Unfortunately they played games all over the place for that tour. There's probably records of which games Starfin pitched somewhere, but I'm not up for finding them at the moment. Any other theories (or maybe someone actually knows) about why no one was scoring any runs in early Japanese baseball? Santa was good to me this year, so I have a few more cards to post. Keishi Suzuki pitched for Kintetsu from 1966 to 1985. In total he pitched 4600 innings and won 317 games. During his career league ERA appears to have averaged around the mid-3s, although with significant variation. I’m just eyeballing this, so that number could be off. But anyway, some years it was down around 3.20 and others up around 4.20. For his career Suzuki had a 3.11 ERA, so he was good for a really long time. 1978 was his best season. He was 30 years old, and posted a 2.02 ERA to go along with 25 wins in just shy of 300 innings, against a league average ERA of 3.68. Suzuki’s stats look a lot like those of a bunch of American pitchers of the same generation (although his innings pitched totals are more impressive, given the shorter season). If you took his career numbers and shuffled them up with those of Gaylord Perry, Bert Blyleven, Phil Niekro and a handful of other guys, I’m not entirely certain that I could tell you which one is Suzuki. In a way, Nolan Ryan isn’t the worst comp. Suzuki barely cleared 3000 strikeouts, but led the league in K’s eight times (vs. 11 for Ryan). Blyleven is pretty good, but he led the league in strikeouts only once. Maybe I’ll go with Steve Carlton as a compromise. Lefty was a five-time K champ, and, like Suzuki but unlike Ryan and Blyleven, left handed. (Or, well, sort of. Suzuki was naturally right handed but learned, at his father’s behest, to throw from the port side.) Also, the Phillies and the Buffaloes were both pretty bad teams. Albright doesn’t like him as much, comparing him to Jim Bunning and Vida Blue. As with most strikeout-friendly pitchers, he relied on a mean fastball (at least early in his career). And like most pitchers who rely on a mean fastball, he was homer-prone, giving up 560 for his career. The MLB record is 522. That Jamie Moyer holds the record doesn’t help my claim about fastball pitchers being homer prone, but I’m pretty sure it’s true anyway. Elevating the bat takes time, so a high pitch is going to give you a little extra “effective speed” (if you will). So if you’re relying on your speed it’s a good idea to throw high fastballs, i.e., one’s that batters can get under and hit in the air. This is why Max Scherzer (for example) is such an extreme flyball pitcher. Suzuki was the same kind of guy. Albright ranks Suzuki was the 79th greatest player of all time. He was a 3x best nine and a 15x all star. Post playing, Suzuki managed the Buffaloes for a few years. He is “credited” with “helping” Nomo come to the US. Apparently (I’m getting this from Albright who is getting it from “The Meaning of Ichiro” so hopefully nothing is getting lost here) Suzuki favored the traditional intense Japanese training program, and didn’t pay any attention to pitchers’ workloads. Albright reports that he had Nomo throw a 191 pitch game once, which would probably get an American manager burned at the stake. Whiting reports that Suzuki was of the opinion that the best way to cure a hurt arm was to pitch even more. Nomo realized that his arm was getting shredded and wanted to get out. Hence, the Dodgers. The Suzuki card is from the 1976 Calbee set. That is actually Meiji Jingu Stadium which is actually still in existence and the home of the Yakult Swallows (though it is scheduled to be replaced in a few years unfortunately). That was probably from Game 2 of the Seals 1949 tour, in which Starfin was the starting pitcher. The stadium still has pretty big foul territory! Thanks for the info Sean! Great to have someone around who actually recognizes the stadium. And A's batters think that they have it bad with foul territory! I've been posting mostly menkos and bromides (with a few Calbees and BBMs thrown in); today I've got my first candy card. Kihachi Enomoto was a first baseman who played for the Orions until his very last season. Between 1955 and 1972 he logged 9000 plate appearances with a batting average just under 300. He had good-but-not-great power. Scouts would have said that his real advantage is with his hit tool. Frequently he hit above .300, topping out at .351 in 1966, and he walked quite a bit more than he struck out. Indeed, Enomoto was extremely good at not striking out. Maybe not Joe Sewell good, but, you know, Yogi Berra good. From his statistical profile I’m imagining a player with a really good batting eye who hits line drives and uses the whole field. Probably not a pull hitter. The 24 homers that he hit in 1966 were the most he had in a single season, and represent about 10% of his career output. That would give us a batting line of 367 AVG / 476 OBP / 663 SLG and 121 runs, 42 HR, and 110 RBI. The rate stats would all have led the league. He would have placed 3rd in runs, 3rd in home runs, and 3rd in RBI. The difference between his rate stats and his run and RBI totals is probably due to his teammates - Yamauchi was long gone by this point and the Orions weren't any good. They finished in the middle of the pack in 1966, a bit below .500. Give him a better supporting cast and he’s probably got much better R and RBI figures. Now sure, that’s his best season, but anyone who can put up a season like that is a beast. Parenthetical remark that I’m not going to actually put in parentheses: a few grains of salt may be necessary when looking at those numbers. Jim Allen has done some really nice work showing that the mean standard deviation across a bunch of measures (win%, batting average, etc.) have gone down consistently over time. In short, dominant performances from early decades of Japanese ball shouldn’t be as surprising as in more recent decades. Now, 1966 wasn’t early exactly, but it’s not recent either. His greatness was recognized at the time. He was a 9x best nine and 12x all star. On the other hand, he never did win an MVP award. Katsuya Nomura won in 1966. There were two reasons for this, one respectable, the other less so. Nomura, while not being as strong of an offensive force, was a catcher rather than a first baseman. And he also played for the first place Nankai Hawks as opposed to the fourth place Tokyo Orions. I guess that I would have voted for Nomura as well, given their positional differences, but Japan’s tradition of giving the MVP award to players from winning teams basically meant that Enomoto didn’t have a chance. Albright calls him the 17th greatest Japanese player, and 4th greatest first baseman. Great though he was, it’s hard to argue that point. Oh, Ochiai, and Kawakami put up some stiff competition. Enomoto played against the Dodgers during their 1956 tour of Japan. He tied the score in an Oct. 26th game, driving in Yasumitsu Toyoda with a single off of reliever Don Bessent. The game was subsequently called for darkness with the score tied at 3. Rookie or not, Brooklyn should have left Drysdale in. Like Hiramatsu Ochiai, but no one else, Enomoto is qualified for the meikyukai but not a member. (Enomoto’s 2000th hit came curtesy of Keishi Suzuki, the player featured in my last post.) He is, of course, a member of the hall of fame, but that was a near thing. He received exactly the number of votes that he needed for election. Not one vote to spare. This is my first caramel card. It’s from the JF2 set. It’s tiny and made of paper. Granted it’s a durable and glossy paper, but it’s definitely not card stock. I wonder how the caramels were packaged? If they were individually wrapped and kind of large (for caramels not baseball cards) I could see this being an insert with a single piece of candy. Nice caramel card, I don't have any of those in my collection. I'm not sure how they would have originally come packaged either, its an interesting question. Tomoaki Kanemoto was a slugging outfielder with very good on-base skills. He played from 1992 to 2012, and is one of the most recent inductees into the hall of fame. From 1992 to 2002 he played for the Carp, and he spent the balance of his career with Hanshin. For career numbers he’s got slightly more than 2500 hits, 476 home runs, and a 285/382/503 slash line. It seems that he had a fair amount of speed, but he didn’t always make good use of it, and lost it as he got older. But anyway, he did manage to steal 30 bases one year. Just going by his raw numbers, 2005 stands out as his best year. He managed better than 120 runs and RBIs, knocked in 40 homers, and put up a 327/429/615 line. All of those numbers except for the on-base percentage were career highs. Let’s compare that 2005 season to league average. The Central League that year hit 270/331/411. That’s a pretty good match for the current American League. Last year they put up a 249/318/416 line. The lower batting average was driving the lower OBP (made up for by a few more walks it looks like), but otherwise pretty similar. To translate Kanemoto’s 2005 season into a contemporary American context, you don’t need to do much at all. Shave off a little AVG and OBP, but it’s close enough I’m not going to bother actually calculating this one. Nobody in the American League had a season last year that was a good match for Kanemoto’s 2005, but Christian Yelich, MVP winner over in the NL, is close enough. They’re actually the same kind of player, it’s just that, except for this past year, Kanemoto was better than Yelich. The weird thing about this guy is that he got such a late start. Kanemoto broke into the league at 24, but didn’t play a full season until he was 28. That’s really old for a hall of famer. Usually those guys have established themselves as superior ball players when they’re in their early 20s (or, in plenty of cases, earlier). Kanemoto has such good career numbers because he managed to hang around so long. He played through his age 44 season. If he’d gotten started at a more normal age (for a hall of famer) he might have managed to join Harimoto in the 3000 hit club. Super weirdly, he made a best nine even before he played a full season. He was selected in 1995 despite missing about 20% of his team's games. One thing that he was known for was endurance. He appeared in 1,766 consecutive games, and broke Cal Ripken’s streak for consecutive innings. (Ripken sent him a bat to commemorate the occasion.) The game that ended his consecutive-games streak almost didn’t. He was sent up to pinch hit, but a runner got thrown out to end the inning and so he wasn’t credited with an at bat. Although he played in the outfield for his entire career he seems to have had a rather weak arm. He was nicknamed “Mole Killer” for bouncing throws to the infield. That’s pretty harsh. After retiring Kanemoto took over managing the Tigers. They finished the 2018 season in last place and Kanemoto apparently blamed himself. Despite attempts by ownership to get him to sign a multiyear contract, he announced last October that he was resigning. As with many former Tigers, thehanshintigers.com has a nice biography of him. And I can’t read it, but he also has his own website. In the early 2000s Upper Deck made a foray into the Japanese market. It didn’t last long, but they did put out a few sets. This card is from the 2000 Ovation set. It's got one nice feature. The stitches on the baseball are... what's the opposite of embossed? Exbossed? Anyway, they stick out, which is a neat touch. Doing the math, that page says it is the average of 738 players. Divideby the 12 teams and that is about 60 players per team. So that average pay includes that paid to the minor league 2 gun players, who would draw the average down a bit, though not that much. The author seems to have understated the average by a factor of 10 when doing the conversion into US dollars, it should be about 200k US for the Carp! Michio Nishizawa had a long and storied carrier with the Dragons and the Stars. Incredibly, he broke into the league at the age of 15. Granted it was only ten innings pitched, but I sure wasn’t playing professional baseball at 15. The only American to manage it was Joe Nuxhall. Nishizawa still holds the record as the youngest professional Japanese player. Early Japanese pro ball had lots of two-way players, but Nishizawa was probably (with maybe the exception of Fujimura) the greatest of them. He was a good pitcher from 1937 (age 15) through 1943 (age 21). In that time he managed about 1100 innings pitched. 1944-5 were lost years. In 1946 he came back to pitch another 120 innings. That was the end of his pitching career. In total Nishizawa pitched 1297 innings, almost exactly the same number of innings as Mariano Rivera, and he managed it before turning 25 and after losing two seasons to the war. Nishizawa served in the war for two years. Wikipedia says that he was injured, baseball-reference merely says that the war “put additional toll on his arm”. Both sources agree that something war-and-arm-related led to his conversion into a position player. His early years were spent with Nagoya – later called the Dragons – and he returned to them immediately after the war, but switched teams, to Gold Star (later Kinsei Stars), mid season. It was with the Stars that he transitioned into a position player. When he returned to the Dragons two years later, it was as a first baseman. His first year in the field he was below average as a hitter, but only slightly, and it didn’t take long for him to develop into an offensive force. He had an OBP 100 points above league average in 1948, and 200 points above average in 1949. His best season as a hitter was 1950, when he slugged 46 home runs and drove in 135 despite the short season. As a hitter he was a slow slugger, and patient too. He walked more than he struck out, and while there were seasons in which the league as a whole did that, his ratio was better than normal. Not, that is, that he did much of either. He was walking and striking out around 40-45 times a year, so he made a lot of hard contact. As a pitcher, he was good but not great. His best season as a pitcher was probably the spring season of 1938 (this was back when they still played split seasons), when he posted an ERA about 30% better than league average. His most successful season was 1940, when Nagoya finished with a winning record for a change (but still finished in just 5th place); he won 20 games that year. The pitching feat for which he is best remember is a 28 inning, 311 pitch complete game against Taiyo. The game ended in a tie. Masahiko (or Masaaki) Mori was elected to the hall of fame by the special selection committee on players. If he really is being inducted for his work as a player, I would have to say that he is wildly overrated. Mori was the catcher for the Giants from 1955-1974, right through the big V9 years. He spent a few years getting his toes wet – he actually broke into the league at 18 – and was a regular at 22. My guess is that he held the job the rest of his playing career, but had a few injuries to deal with towards the end. He made 11 consecutive all-star appearances, and was picked to eight consecutive best-nines. I don’t feel like wading through Central League catchers in the mid 60s at the moment, but I am extremely skeptical about this. As a player he was… eh… he was a catcher. Career slash line of 236/283/318 isn’t going to scare anybody, pretty much regardless of context. Little in the way of on-base skills, little power. He never cleared a 400 slugging percentage in a full season. Eyeballing it, his best year looks to have been 1964, a year in which he was a little bit worse than average in on-base percentage and a little bit better than average in slugging percentage. And that was his best year. Maybe he was good with the glove? Allow me some speculation/commentary on American baseball. In the American game guys who play important defensive positions on great teams tend to be held in higher esteem than they actually deserve. Sometimes they even get elected to the hall of fame (cf. Phil Rizzuto). Maybe that’s what was going on with Mori, because the guy’s offensive profile is just not impressive. Albright does not rank him among the top 115 Japanese players, and doesn’t give him an honorable mention, either. Now, catching for Yomiuri isn’t all that he did. He was also a very successful manager. Mori was in charge of Seibu (the Lions) from 1986 to 1994, and then spent a couple years in this century with the Bay Stars. This was during the Lions’ streak of dominance – they won the Japan series six times in nine years. In total the teams that he was – in one way or another – involved with finished in first place 27 times. As a manager he was relatively relaxed, not a devotee of the Kawakami school of managing. (Peculiar, since they were teammates and Kawakami was later his manager. Or maybe it’s not peculiar, maybe he hated doing 500 fungo drills per day or whatever Kawakami had them doing.) Despite being non-traditional, the success was hard to ignore, and Mori won Japan’s version of the manager of the year award (Matsutaro Shoriki award) twice. Pictures of his hall of fame induction ceremony here. The card is from the JCM39 set, a pretty common one. And it’s not as yellow as it looks in the picture. Choji Murata pitched for the Orions for 22 years – 1968 to 1990. He was 18 in his first taste of pro ball, and retired at 40 with a 3.24 ERA in 3331 innings. (He couldn’t manage just two more innings?) The mid-to-late 70s were his best period. During this stretch he regularly logged an ERA in the 2s with innings totals that wouldn’t be embarrassing in MLB. 1976 was his single best season: he went 21-11 with a 1.89 ERA in 257 innings. Murata was the second Japanese pitcher to get Tommy John surgery. The arm abuse that Japanese pitchers put up with took its expected toll, and in 1982, at 32, he, like so many pitchers before him, simply couldn’t pitch anymore. He tried basically everything else that you can do to get your arm working again, including, unwisely, trying to pitch through the pain. Predictably, it didn’t work. As a 32 year old he pitched 40 innings, and then that looked like that. In a last-ditch effort he flew to LA to get ligament-replacement surgery and missed the entire 1983 season and almost all of the 1984 season. He would never again manage the kind of innings pitched that he did as a young man, but by the time he was back on the field he was in his mid-30s, so some age-related decline is to be expected. By age 35 Murata was again pitching more-or-less full-time. He was reasonably successful in 85 and 86, dipping to below-average production for a couple seasons afterwards, and then led the league in ERA in his penultimate season. The same year he was named the all-star game MVP and given a $14,000 prize. (Presumably the amount is approximate. The figure is from the AP.) If forced to pick a comparable American player, I might come up with someone like C.C. Sabathia. He was a three-time ERA leader, but made only a single best-nine and never won a Sawamura Award. Post-career, Murata stayed in shape. In what appears to have been a publicity stunt NPB had Kazuhiro Kiyohara-he was retired already, this was in 2013-try to hit a home run off of a few old-time pitching greats. Anyways, Murata struck him out, topping out at 83 mph. Now, 83 mph is really slow for a professional, but considering that Murata was sixty four years old at the time, I think that we can forgive him. Here’s a short clip of Murata pitching. The card is a Calbee, from the 1989 set. The last (I think) of the super small cards that Calbee produced in the 80s. Yoshinori Hirose was an outfielder (although one with a fair amount of time at shortstop and a small number of games elsewhere in the infield) for the Nankai Hawks from 1956 to 1977. After 1972, however, he was strictly a part-time player. Hirose’s biggest calling card was his speed. With a total of 596 stolen bases he’s Japan’s #2 all-time base stealer. Now that’s still only 60% of Fukumoto’s total, so Fukumoto basically laps the field on base stealing, but it’s pretty good. Actually, I’m surprised that there aren’t more big base stealers in Japan. Japan is famous for playing small ball: bunts, hit and runs, etc. The stolen base should fit into their tactical philosophy perfectly. Of course Japanese seasons are shorter than American ones, and the history of Japanese pro ball is shorter than American pro ball, but Hirose’s stolen base total, #2 in Japan, would be tied with Dummy Hoy for #19 all-time in MLB. As for efficiency: he was successful in 82.9% of his stolen base attempts, which would be 26th all-time in MLB, a fraction above Jacoby Ellsbury. As a batter Hirose was above average in both OBP and SLG, but neither one was outstanding exactly. I grabbed 1961 (age 24) pretty much randomly, and decided to translate it given the context of the 2018 NL. You’d end up with an OBP of about 350 and a slugging percentage of 457. That’s good and all, but neither mark would be among the league leaders. He’d also have (eyeballing this one) stolen base totals in the low 50s. For a comparable American player I’m going with Max Carey. In context Hirose may have been a somewhat better hitter, but they’re pretty close. His best season was 1964 when he was a huge offensive monster, with a slugging percentage like 66% higher than average, albeit one driven by batting average not by power hitting. Presumably that was a result of an unsustainable batting average on balls in play. Players (in MLB at least, probably elsewhere) have more control over their BABiP than do pitchers, but they also each have an established level to which they tend to regress. Given that Hirose never again (and never before) approached a 366 batting average, my guess is that he got lucky on balls in play that year. This blog has a really nice progressive leaderboard for stolen bases (as well as lots of nice pieces on Japanese baseball). Hirose was the all-time leader from 1970 to 1976 (inclusive). The card is a menko from JCM 13a. It was issued in 1960. Nice, you are getting close. I'm curious, besides Sawamura, which other members of the Hall of Fame have no career contemporary cards of them? Rob tells me that there are no playing-days cards of Masaru Kageura, Miyoshi Nakagawa, Yukio Nishimura, Eiji Sawamura, or Masaki Yoshihara. Additionally, the only Tsunemi Tsuda cards are from when he was an umpire, so I've removed him from the list also. My want list didn't have any of the players who made the hall of fame for their amateur play on it, so there may be (almost certainly are) amateur HOFers for whom there are no vintage cards. Masaji Hiramatsu pitched for the Taiyo Whales for 18 years. In 1967 he broke in as a 19 year old, and he retired at 36 after the 1984 season. He was consistently very good. But the Whales… the Whales were not. Despite being a very good pitcher, Hiramatsu just barely managed a winning record: 201-196. I nominate Ted Lyons as a similar American player (although Lyons played until he was much older). In what was probably his best season he went 25-19 (both figures led the league) with a 1.95 ERA for a Whales team that managed to claw its way up to third place. But within a couple seasons they were back to fifth. Japan in general seems to be more contact-oriented than the US, and Hiramatsu’s strike out rate doesn’t seem to be especially impressive. He was K’ing 5.5 per nine innings. Spot-checking a few seasons, it looks like his strikeout rate was slightly better than average. Likewise his control – about 2 K’s per walk for his career – was a little bit better than average. With that kind of profile, my guess is that he had some good defenders behind him. And sure enough. I just checked the Whales’ shortstop, who would make the biggest difference for a contact-friendly pitcher. For most of Hiramatsu’s career it was a man named Daisuke Yamashita. I’d never heard of him before just now, but he is an 8x gold glove winner, and baseball-reference refers to him as a “defensive wizard at shortstop”. Yamashita isn’t in the hall of fame, but I sure hope that Hiramatsu gave him a nice tip of the cap during his acceptance speech. Hiramatsu himself made eight all-star teams, two best-nines, and took home the Sawamura award in 1970. His trademark was his shuuto pitch – sort of a hard slider/curve which is very popular in Japan but almost unheard of in the US. It may have been the best shuuto of all time. Over time arm injuries caught up with him, however, and he had to start mixing in more pitches that are easier on the arm. As a boy Hiramatsu had been a huge Giants fan. I get the impression that just about every baseball fan in Japan is a huge Giants fan. Anyway, he starred at the Koshien tournament in high school (his team won; and in 2018 he was invited back to throw out the ceremonial first pitch in a few of the matches) and turned down a contract with the Dragons to play in the industrial leagues. Jim Allen reports that the Giants busily tried to recruit him during this time, but once he was eligible they turned him down. Ouch. He did get a little bit of revenge: despite playing for the dismally bad Whales, he had a winning record against the Giants. Here is a really interesting look at his delivery. The text below talks about the nature of his shuuto and how he delivered it. My card is from the 1979 Yamakatsu set.